The ACM 1998 Workshop on Java for High-Performance Network Computing, held February 28 to March 1 at Stanford University, Palo Alto, California, gave 200 attendees the opportunity to learn what is required to successfully deploy the Java programming language in scientific and high-performance network computing environments. This was the third in a series of workshops originally started by CRPC researcher Geoffrey Fox of the Northeast Parallel Architectures Center at Syracuse University. The previous Java workshops were held in Syracuse in 1996 and Las Vegas in 1997. Tomasz Haupt of Syracuse University gave a talk on "DARP: Java-based Data Analysis and Rapid Prototyping Environment for Distributed High Performance Computations." 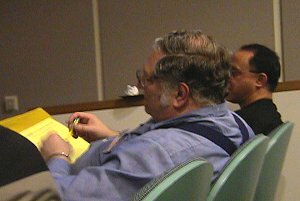 Co-chaired by Siamak Hassanzadeh (Sun Microsystems Computer Corp.) and Klaus Schauser (University of California at Santa Barbara), the 1998 workshop focused on the use of Java in engineering and scientific computing, simulations, parallel and distributed computing, data-intensive applications, and other emerging areas that combine communication and computing. Eighteen papers selected from 57 submissions covered implementation and compiler technology, numerical libraries, communication, applications, distributed computing environments, visualization, and other areas of Java technology. Another 18 papers were presented in a special poster session. The Program Committee included CRPC researchers Fox, Mani Chandy (Caltech), Jack Dongarra (University of Tennessee/Oak Ridge National Laboratory), Ian Foster (Argonne National Laboratory), Dennis Gannon (Indiana University), and Carl Kesselman (University of Southern California). Gannon chaired a session that featured a paper co-authored by Dongarra, "Developing Numerical Libraries for Java." Chandy and co-researchers Adam Rifkin and Eve Schooler of Caltech presented a poster on "Using Announce-Listen with Global Events to Develop Distributed Control Systems." Fox and co-researchers Erol Akarsu and Tomasz Haupt of Syracuse gave a talk on "DARP: Java-based Data Analysis and Rapid Prototyping Environment for Distributed High Performance Computations," while Byeongseob Ki and Scott Klasky from Syracuse described their Java-based approach to "Collaborative Scientific Data Visualization." In a poster, a Syracuse group led by Bryan Carpenter described its HPJava activity to incorporate data parallelism into Java. The workshop included a half-day Java Grande Forum, chaired by Fox, to develop a community consensus and recommendations on key aspects of Java and its associated runtime to increase the ease of use and performance of the language in large-scale computations. Steering committee members are now being selected to organize a May forum, where serious discussions on improvements to Java will continue. It is expected to involve major High Performance Computing Community representation from academia, government and industry, including Sun Microsystems, IBM, Intel, and Microsoft. The forum hopes to shape the development of Java so that it does combine high performance with its natural advantages in having strong industry and web support. This could lead to Java becoming the premier language for scientific and engineering computation. The 1998 workshop was sponsored by ACM SIGPLAN, with funding from the NSF and DARPA to support student participation. Sun Microsystems printed the proceedings and Microsoft sponsored a dinner for attendees on February 28. 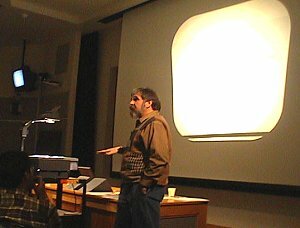 For more information about the 1998 Java workshop, including 35 online papers, see http://www.cs.ucsb.edu/conferences/java98/. For a general resource that includes a mailing list pointer and papers from the first two meetings, see http://old-npac.ucs.indiana.edu/projects/javaforcse/. Professor William Kahan of the University of California at Berkeley (left) and workshop co-chair Siamak Hassanzadeh of Sun Microsystems attended one of 18 paper presentations.